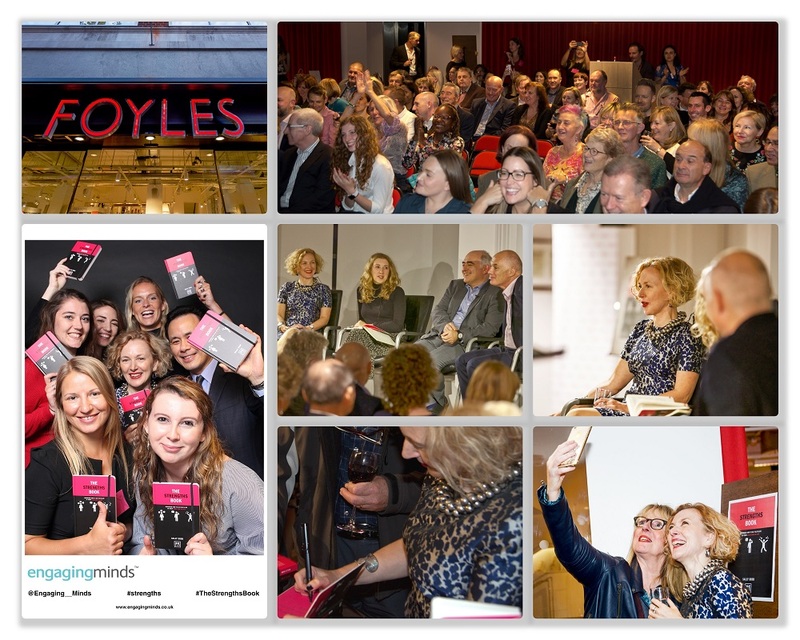 My latest book, The Strengths Book, was launched at Foyles flagship bookstore in London on the 25th October. I was very excited about it but also quite anxious. The Strengths Book means more to me than most of my other books have done because of the subject matter and the difference it will make to people’s lives. As a result, I had extremely high expectations for the launch. I wanted everyone to ‘get’ the power of strengths, feel inspired and leave wanting to spread the word. So, yes. I had high hopes. And, the inevitable accompanying nerves. I needn’t have worried. The evening was a huge success. Guests have since described it as “amazing”, “a triumph”, “thoroughly enjoyable”, “moving” and “captivating”. I’ve been reflecting a lot on what made it go so well. Knowing and being who we really are is essential to a fulfilled life and mental wellbeing. It’s also at the core of what society needs, to tackle the most important and urgent issues facing us. We must find ways to release people’s true strengths, if we are to have productive and effective organisations that make a difference. One of the guests sent me an email, saying, “There was a great atmosphere with such a distinguished and captivating panel and questions from the floor about things that matter. I am grateful that smart and composed people are pushing the changes that need to be made in today’s society.” Wow! I couldn’t have wished for better feedback than that. The questions were wide-ranging. Many were about how we can we help young people to make good career choices and prepare for a world where what children learn in school today may well be irrelevant for the future. The panel were also asked about robotics, artificial intelligence, retirement, personal relationships, values, the decline in arts subjects in schools, and why and how strengths matter in relation to these issues. There really was a sense that we were exploring very important topics. The usual format for book launches is that the publisher introduces the evening by speaking about why they commissioned the book, then the author gives a speech about the book. This time round I wanted to bring other voices in. I wanted the guests to hear about the power of strengths approaches in education, in business and for people with conditions like autism and dyslexia. So I decided to break from the traditional format and put together a panel. Stefan Stern was the obvious choice for me as panel host. He’s a business and management journalist for the Financial Times and Guardian, he’s interested in the subject of strengths, and he is a real pro when it comes to panel hosting. He did a superb job. He asked incisive questions himself and, then, when he turned the questioning over to the audience he ‘read’ the dynamic in the room perfectly. He went with the flow and let the panel discussion run over time because the questions kept coming and the audience seemed riveted. It did mean I had to ditch the ten-minute, carefully thought out speech I’d planned, and do a five-minute, improvised version instead! But it was so exciting to see the engagement and interest from the audience, that I didn’t mind at all. Iain Wilkie, a Senior Partner at EY, a global professional services firm, is a thoughtful person whose belief in people being their whole selves shines through. The moment when, talking about diversity and inclusion in the workplace, he stammered on stage and jokingly commented “what I’m saying is worth repeating” visibly moved the audience. Millie Townsend, an effervescent and inspiring teacher and careers advisor, told stories of young people discovering their strengths, and caught everyone’s attention when she spoke about one young man who was being steered away from his heart’s desire (to be a blacksmith). Millie’s insight into what helps and hinders young people from being who they really are made for compelling listening. Aesthetics matter a lot to me. I think environment and design affects how people feel. I wanted a friendly, warm vibe that also felt professional, stylish and fun. The Foyles event space is beautiful, light and uplifting and provided the perfect canvas for us to create the look and feel we wanted. A huge amount of design and planning went into the evening. From deciding to use the Photo Booth to add some fun, to using a black polished grand piano as a book signing surface, it all was carefully thought through. The right people made everything happen and work. Janet, my PA, and Ruby, the Foyles event manager, both have high standards and a nothing-is-too-much-trouble attitude. With them around it’s like having your best friends organise your birthday party – they really want the event to go well and do everything they can to make sure that it’s a success. It was such a mixed audience. Family and friends of course, people from the education world, the arts, business, healthcare and prisons. There were many current and former clients and colleagues in the room – all of them interested in the strengths approach to life and work. Judging by what people said on the night and have said since, they all found the discussion really interesting. As Martin Liu, the publisher, commented to me afterwards, people seemed “verging on super-inspired”. I once read that a good speech inspires people and a great speech causes people to take action. Given some of the follow-up messages we have received, I am thrilled that the launch fits into the latter category. Many people have told their friends and colleagues about the book. Some bought copies for them on the night. Others have connected us with organisations who may be able to help get the book into the hands of young people. And some have asked us to help them introduce a strengths approach into their organisations. You can’t plan these, of course. But, there were two very special ones that night, for me. An American woman arrived and greeted me warmly. I knew that I knew her but could not place her. Then another lady stepped forward, and it dawned on me. I had met these two women (who live in Dallas) last year on a train from Toronto to Vancouver. We’d got on really well. They knew I had a book coming out and had contacted my PA, telling her they wanted to surprise me by coming to the launch. They’d sworn her to secrecy, and so it was one of the most touching moments of the whole evening when I realised who they were and that they had come all the way from Dallas to help celebrate my book. My second magic moment came right at the end of the evening when I learnt about Alex, one of the barmen. Alex hadn’t wanted to work that evening, but he did because they were short-staffed and his boss begged him to. When our guests had all left and everything was being packed away, he sought out his manager. He thanked her for pushing him into working at the launch party because, he told her, that what the people on the panel said had inspired him and made him feel better about himself. I want this book to help many more people like Alex. As I said in my speech on the night, The Strengths Revolution is about helping people to understand who they really are and what they want to contribute. It’s about putting humanity back into the workplace. This book matters and the launch seemed to convince people of that and inspire them to do something about it. I couldn’t wish for more. 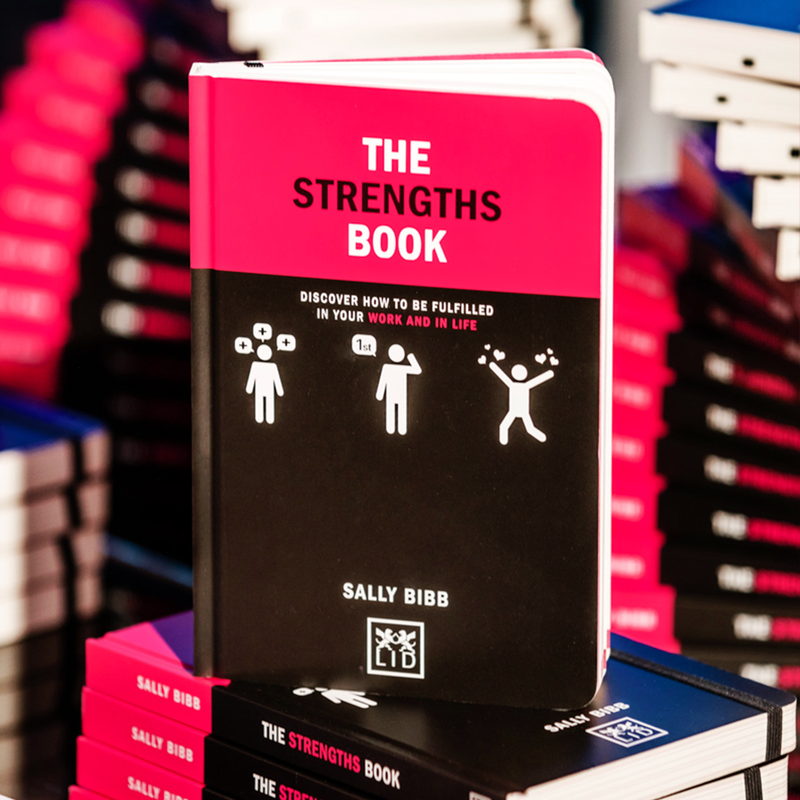 Now EVERYONE can discover the power of strengths with Sally Bibb’s book The Strengths Book: Discover How to Be Fulfilled in Your Work and in Life. Sally Bibb is the author of Strengths-based Recruitment and Development: A Practical Guide to Transforming Talent Management Strategy for Business Results and The Strengths Book: Discover How to Be Fulfilled in Your Work and in Life, and is a leading strengths expert.